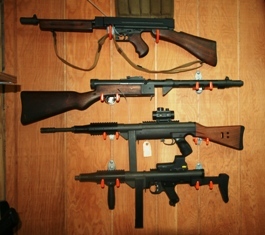 Stemple Thompson kit, STG K34 machinegun kit and U45/U9 Kits. Check them out at www.brpguns.com see the adds in Firearms News. 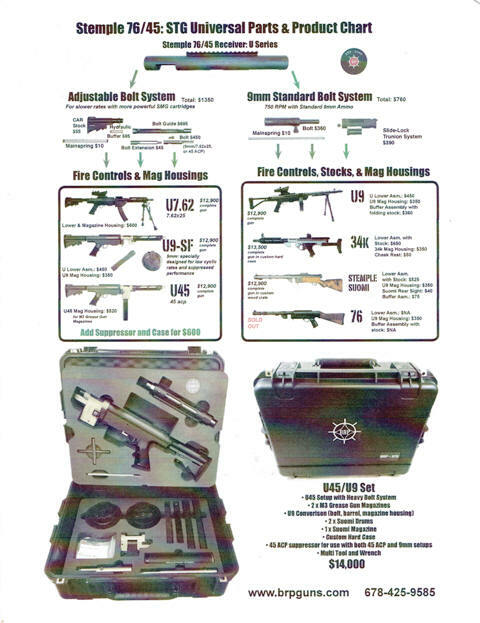 We Currently have 3 - U45/U9 Kits, 2-BRP/Stemple Tommy gun kits, 1-K34 kit also a U9 kit for a great price on consignment at a local gun store. All Items are in stock available for transfer. The U45/U9 and K34 kits have a silencer in the kit. We can order any of the other fine BRP Products or facilitate the Transfer of Purchases directly from BRP. We help you do the paperwork and guide you through the whole process. Call us for a Demo. Serious inquiries only please. This Item in Stock ready for transfer! Kit includes: Extra Threaded barrel, 50 Rd. Drum Mag., 30 Rd. Stick Mag., Multi-tool set, Mounting rails, Case and Owners/users manual. Full Auto only. sight included. Also included are two like new 08/15 8mm barrels. Runs great. This gun still carries the DWM Manufacturer on side plate and the transfer form. May have been a re-wat de-wat.